Ski in & Out! 3 Bdrm, 3 Ba! Hot Tub! Views! Walk to Ski School! 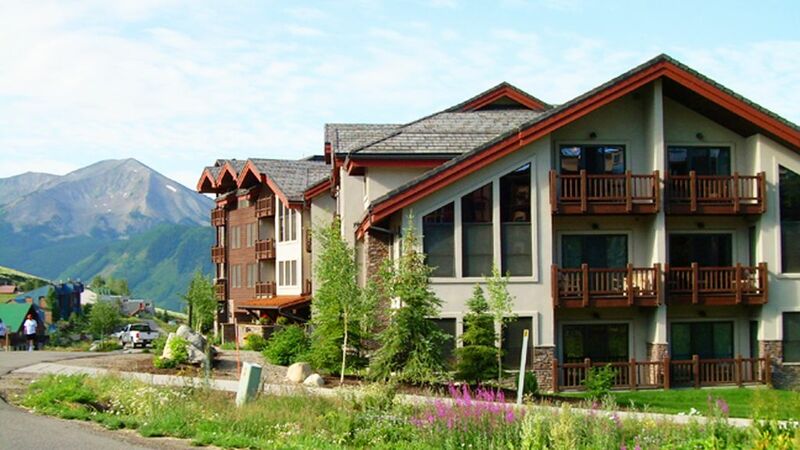 Ski in & Out 3 bdrm 3 ba Condo! Hot Tub! Walk to ski school! Black Bear Lodge is Located About 20 Yards from the West Wall Lift and from ski school. It is a gorgeous luxury new ski lodge with a heated covered garage; outdoor hot tub; a large common lodge area with a TV, and huge real fireplace. Ski lockers. Great wifi throughout. Great discounted ski rentals available! Ski lockers! Gorgeous hot tub! Fireplace! full fully stocked kitchen. Washer and Dryer in the condo. New sheets and towels! Beautiful new area rugs! and lots of utensils! King-size master, with its own bathroom, and twins in two guest bedrooms (4 in all) - all top-of-the-line Simmons Beautyrest mattresses. EACH room has its own bathroom. So 3 full baths. Great outside hot tub, indoor heated parking, huge outdoor grill. This is a beautifully furnished, western themed, three-bedroom, three-bath condominium in one of Crested Butte's newest properties. Beautiful views down valley toward town of Crested Butte from a lovely porch! Porch has chairs to sit. The bus to town stops at the corner on the side of the building, so really easy to come and go for the kids, without a car. For your car, there is covered, heated parking with extra guest spaces. I have been managing this property for 5 years now, with the help of the best property managers in CB. The owners are lovely people - a dentist and his wife, from Little Rock. Fireplace, Phone, Cable TV, VCR, Stereo, CD Player, Fully equipped Kitchen, Microwave, Dishwasher, Refrigerator, Ice Maker, Cooking Utensils provided, Linens provided, Washer, Dryer, Hot Tub (shared), Garage, Gas Grill (BBQ), No Smoking, No Pets, Home Theater System, DVD and CD Library, Jetted Tub in Master Bath. Humidifiers in each bedroom. DISCOUNT SKI TICKETS AVAILABLE. Very nice condo. Perfect for two families. Nice condo. Needs a new carpet but otherwise very nice. View is limited from the first floor. Great slopeside condo steps away from the lift! Our group of 2 families with 4 adults and 4 kids had a wonderful time during a long weekend ski trip to Crested Butte. Plenty of room and great kitchen. Love that the West Wall lift is just a short walk away. Sheets on beds were fine but extra linens (such as for sleeper couch) had holes in one and stain in another. Also towels could be updated as well. House-keeper was great and fast to respond. She brought extra sheet the next morning. thankyou! come again! yes we have the best housekeeper in CB! Great unit across the street from dropping your skis on the ground and clipping into your bindings. The unit was very clean and had all the amenities needed. The rooms were large and the 3 bathrooms were clean and perfect for 4-6 people. I'd definitely recommend staying here as it met all our expectations. Thank you so much for your kind review! We would love to have you visit again someday!! The summers are especially spectacular, when the flowers are in bloom! We really enjoyed this unit for our party of 4 adults. Took advantage of the hot tub and grill, which were right outside the unit. Appreciated the crock pot too! Just a short walk to the Westwall lift. Thank you so much for your encouraging review! We hope you will visit our place again sometime! Summertime is stunning!! We are glad you enjoyed our little slice of Heaven on Earth. There is a $125 cleaning fee. We ask for a $250 damage deposit in a check - it is not deposited.